Kheer is a milk pudding flavoured with cardamom, raisins, saffron, cashews, pistachios, almonds or other dry fruits and nuts. This Carrot Sabudana Kheer - Carrot Sago Kheer is a twist to the traditional sabudana kheer. The addition of grated carrot (gajar) gives a beautiful color and a healthy touch to this kheer. Kheer is an Indian style eggless milk pudding. This is a sweet dish (dessert) originating from the Indian subcontinent. Kheer is a milk pudding flavoured with cardamom, raisins, saffron, cashews, pistachios, almonds or other dry fruits and nuts. Kheer recipe is generally cooked by boiling with milk, sugar, nuts, cardamom and any one of the following: rice (chawal), broken wheat (dalia), tapioca (sabudana), vermicelli (sevaiyaan), bottle gourd (lauki), pumpkin (kaddu) sweet corn (makki). What is carrot sabudana kheer? Kheer in general is a pudding. And Carrot Sabudana Kheer is a little twist to regular sabudana kheer. It is delightfully sweet, and the addition of grated carrots (kisi hui gajar) add natural sweetness and a gorgeous texture and color to this kheer recipe. Why this kheer is perfect as a quick, delicious and healthy dessert? Sabudana or sago/tapioca pearl has carbohydrates, and when you combine with milk, carrots and nuts, this pudding gets packed with full of energy. Adding saffron to this recipe, gives it a nice color and aroma, which makes it a deliciously desirable dessert. You can cook this dessert in just 30 minutes. How do you serve Carrot Sabudana Kheer? Kheer is best served hot or cold. This dish is typically served during a meal or as a dessert or as side dish with Puri. How do you make Carrot Sabudana Kheer? Preparation of Carrot Sabudana Kheer is quite simple. 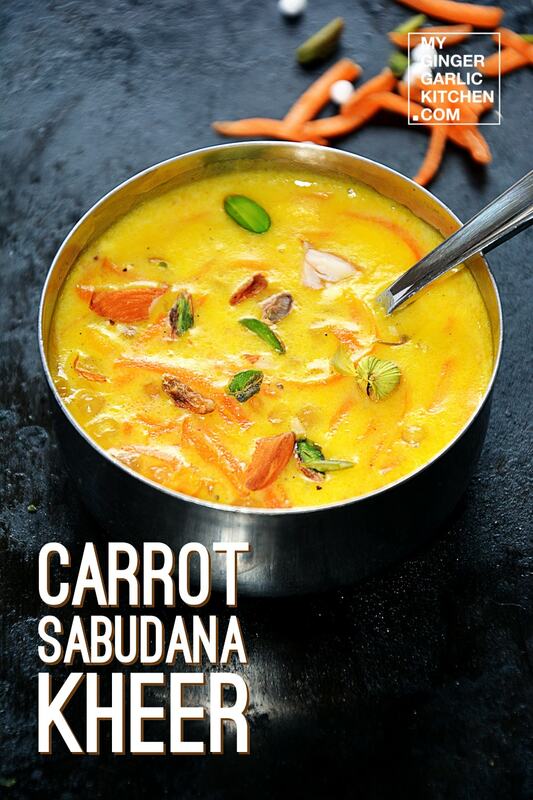 For making Carrot Sabudana Kheer, first you wash and soak the sabudana covered in 1 cup of water for about 45-50 minutes. Drain the extra water, and keep aside. Heat a pan, and add ghee to it. When ghee is hot, add shredded carrot to it, and sauté for 5 minutes. Add milk and crushed saffron to carrots, and stir continuously till milk comes to boil. Once milk has boiled, add sabudana and cook on medium heat for 3 minutes, or till sabudana turns translucent. Do not overcook sabudana. Add sugar, and cardamom and let it cook for another 4-5 minutes. Add chopped pistachio, and chopped almonds and mix well. Remove from heat. Delicious Carrot Sabudan kheer is ready to be served. It can be served hot or cold. Let us learn how to make Carrot Sabudana Kheer in simple and easy steps. This Carrot Sabudana Kheer - Carrot Sago Kheer is a twist to the traditional sabudana kheer. The addition of grated carrot (gajar) gives a beautiful color and a healthy touch to this kheer. 1. Rinse sago pearls (sabudana) and soak them covered in 1.5 cups of water for about 2 houes. Drain almost extra water, and keep covered for 1 hour or until sabudana is soft. 2. Heat a pan, and add ghee to it over medium heat. 3. When the ghee is hot, add shredded carrot to it, and sauté for 5-7 minutes. 4. Add milk and crushed saffron to carrots, and stir continuously till milk comes to boil. 5. Once milk has boiled, add soaked sago (sabudana) and cook on medium heat for 5 minutes, or till sabudana turns translucent. Do not overcook sabudana. 6. Add sugar, and cardamom and let it cook for another 4-5 minutes. 7. Add chopped pistachio, and chopped almonds and mix well. 8. Remove from heat. Delicious Carrot Sabudana kheer is ready to serve. 9. Garnish with chopped almonds, pistachios and serve. It can be served hot or cold. 1. 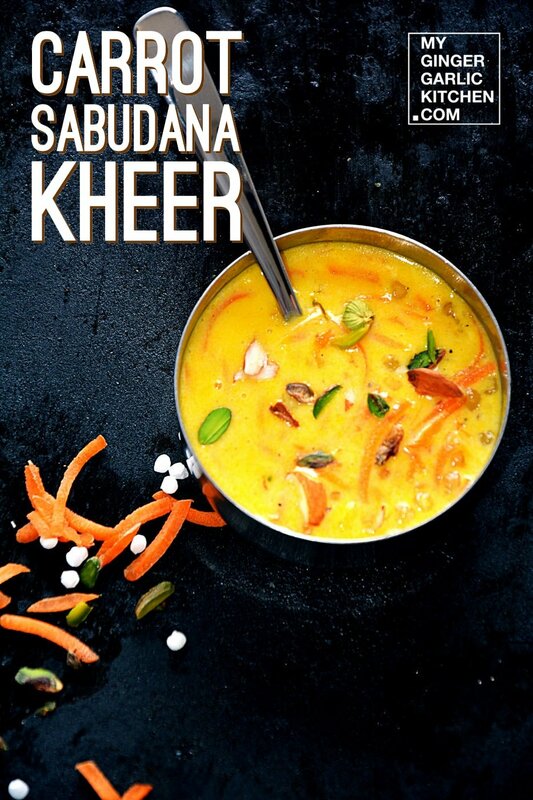 This festive sabudana kheer can be served during Navaratri or other fasts.